Seventeen students from Olin College of Engineering have spent the semester studying the lifecycle of clothing in Professor Caitrin Lynch’s new “Dirt to Shirt” course. The students, all in their first year of college, have learned to look at their clothes through a different lens and consider the future of the clothing industry’s global supply chain. “The course talks about the global apparel industry, and we start with how the cotton is grown and how it’s produced, and then go to manufacturing, all the way to clothing after it’s been worn, used, and thrown away,” explained student Maya Calabria, whose interests lie in becoming a mechanical engineer. Members of the community take an interest in Olin College students’ classwork on bringing awareness to the global apparel industry’s wastefulness. Earlier in the semester, the class took a field trip to the Needham Community Council thrift shop, where they saw how a piece of clothing’s life could continue, rather than be tossed in the garbage. Each student took home an item from the thrift shop and chose one aspect of it to be preserved in a resin block with a wood stand. The students also wrote stories speculating on the history of the article of clothing and created bags made from their thrifting finds. 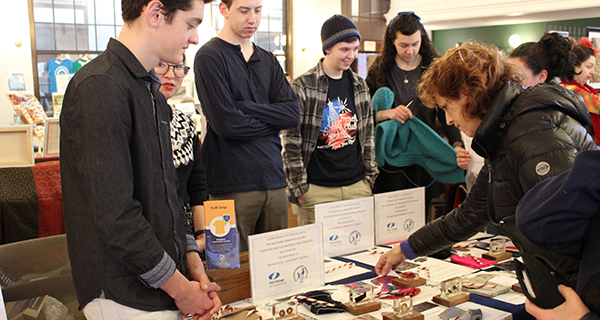 In lieu of a final exam, the students took their resin blocks and stands, the small pouch, and the story of their article of clothing to the Needham Winter Arts Festival in Town Hall to sell their creations, with all of the proceeds going to the Community Center. The purchases, which were donation-based, also included a flash drive of the stories and an introduction to the project, as well as a sweet candy cane treat. Although most students originally selected the course to fulfill their arts, humanities, and social science requirement, many of the students have become very passionate about reforming the industry.